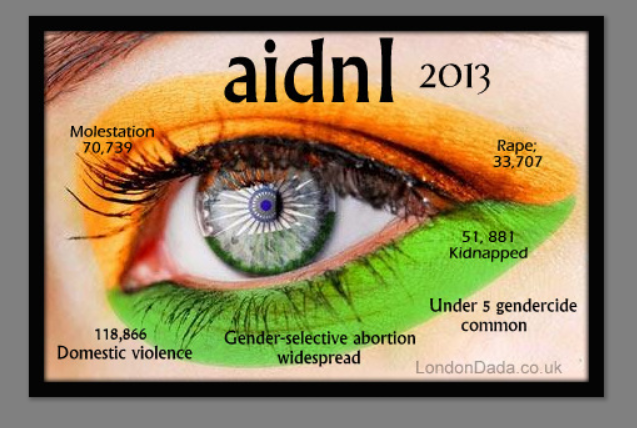 This, after4000 years of reading Bhagavad Gita and daily temple worship. London Dada; continuing the independent art protest & social perception/change movement in the 21st C.
London Dada’s objective in bringing the graffiti artist Banksy’s true appearance and identity to public attention lies in our belief that the art world would be a much healthier and just environment for all artists to operate successfully if such an honest and plain-speaking force for good that Banksy undoubtedly is, abandoned his now slightly tedious anonymity, screwed-up his courage, stepped out of the shadows and into the limelight to take his enlightened messages into the mainstream media interview and public appearance arena. 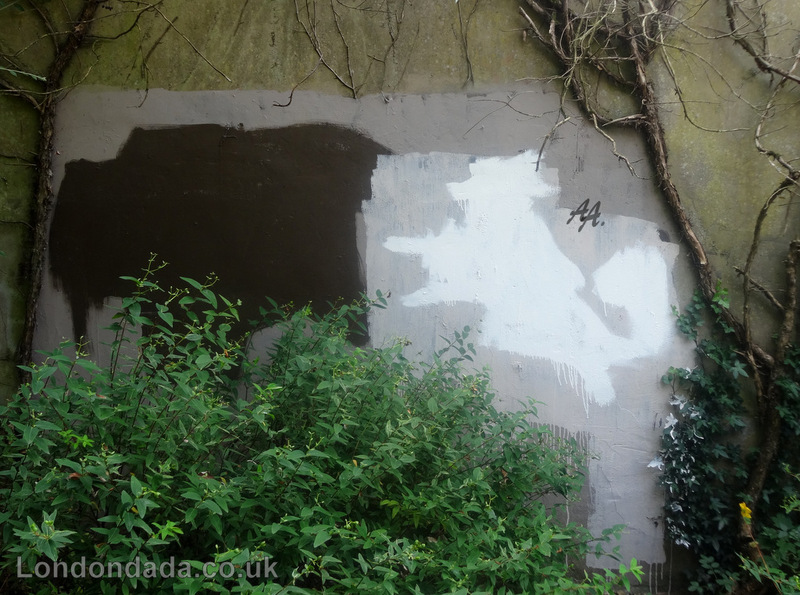 Banksy spotted in Spitalfields, August 2014. Rob Gunningham caught short, photographing what was probably intended to have been another addition to his collection of assorted street graffiti images, ( alongside a bulging scrap book of other artist’s torn cartoon pages it looks like; all for consideration to integrate into future Banksy works ** ). 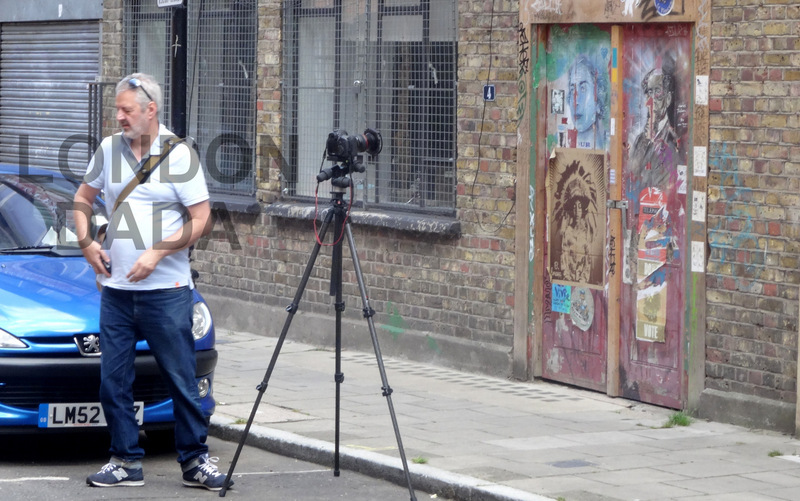 Comparing Rob’s height with the old trade door and almost certainly the obscuring nearby (getaway) car in the image ( Stanmore plate ) , we estimate Banksy to come in at around the 6ft mark – maybe 6ft 1″ – 6′ 2″ in New Balance trainers. He’s certainly a tall guy. 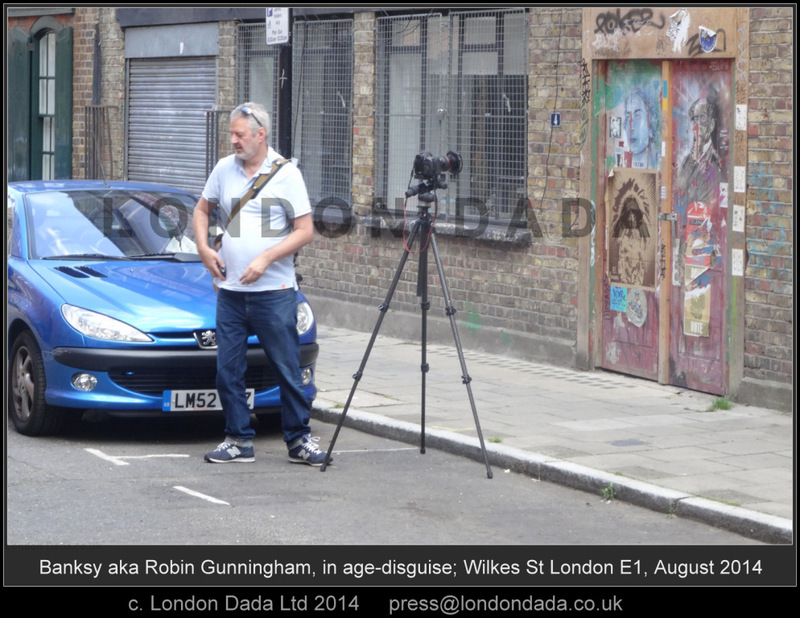 August 3rd 2014, Wilkes Street London E1. 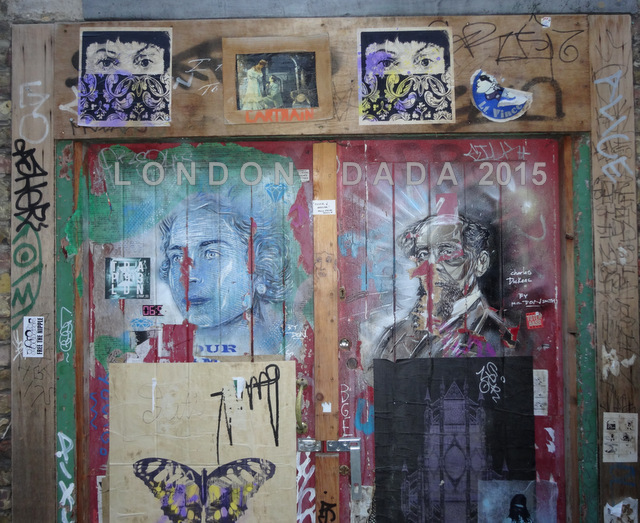 An early Sunday morning chance encounter with two men, both noticeably avoiding attention in this deserted street, turning their backs as they were approached by London Dada’s Art Axis. The tall silver-haired one who had bent forward, away from the approaching Art Axis, to attend a pro camera setup and apparently procuring photos of Dale Marshall-like graffiti and sundry adulterated posters adorning a dilapidated commercial twin door; on a signal from his assistant on the opposite side of the street at the sight of AA’s camera, stood, turned and stepped quickly out, placing one leg in front of the parked blue Peugeot hatchback, covering the full registration number on the plate. 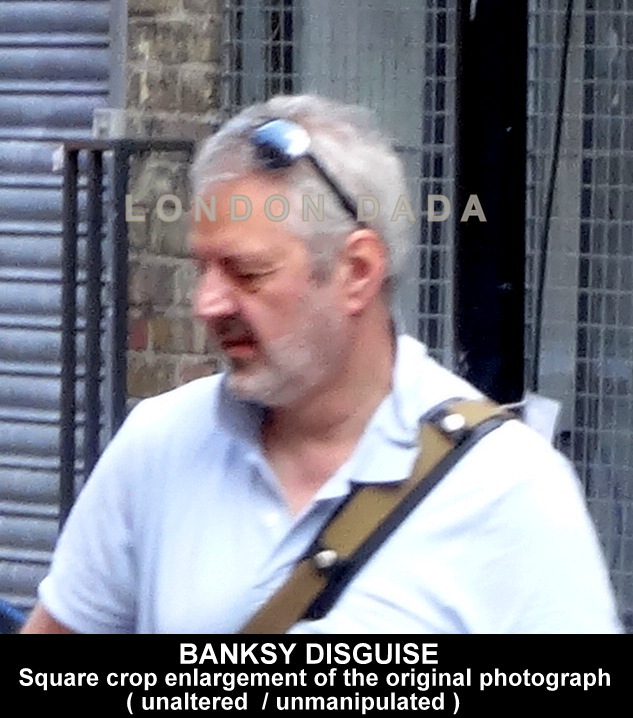 On viewing the total of 4 images we captured of this individual and his shady ducking & diving assistant / minder, it became clear by the identical features and proportions to those of the person reliably claimed to be *Robin Gunningham / Banksy by the Daily Mail in 2008 ( see below ) : that this indeed is Banksy himself. In addition to the overall features in this picture both proportionally and specifically matching the famous Jamaican image of Gunningham from 2004, featured reversed in the Daily Mail in 2008, short moustache ( concealing a childhood lip surgery scar ) below a distinctive Punch & Judy chin, aquiline nose, high forehead with hairline interrupted by a widow’s peak, all being pretty much dead ringer giveaways. 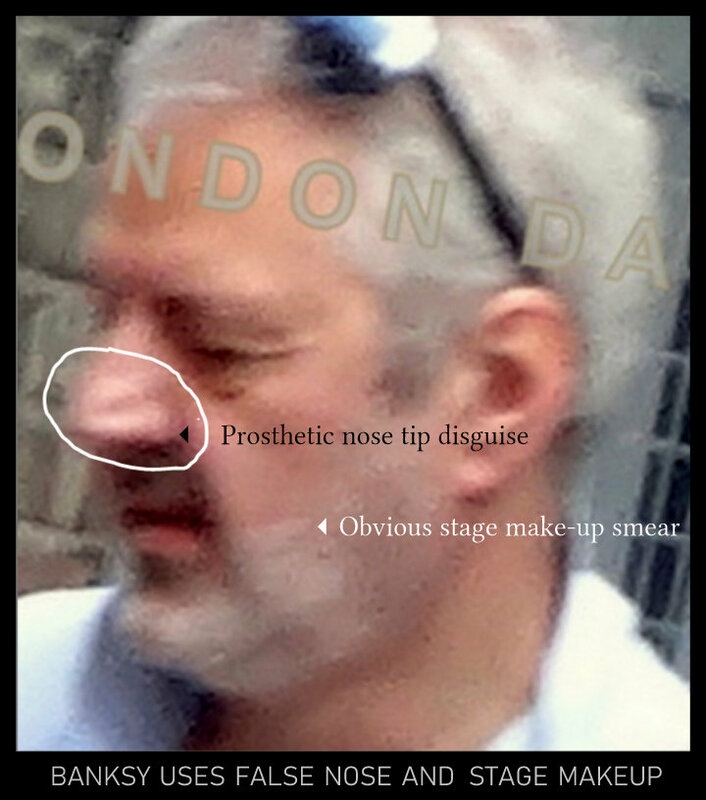 The dyed silver hair & blotchy white make up-powdered stubble smear being an obvious attempt at c. +25yrs age disguise. Who else on the planet would make this big an effort to mask their appearance, including probably a latex prosthetic sharp end nose piece when out in public working around street graffiti? * If Robin Gunningham, ex public schoolboy from Bristol, for whom there’s pretty indisputable evidence of being a real person is not Banksy, then why is he not listed on any public records, the Electoral Register, nor come forward after seeing his name plastered all over the ‘net to make clear he’s not the man? 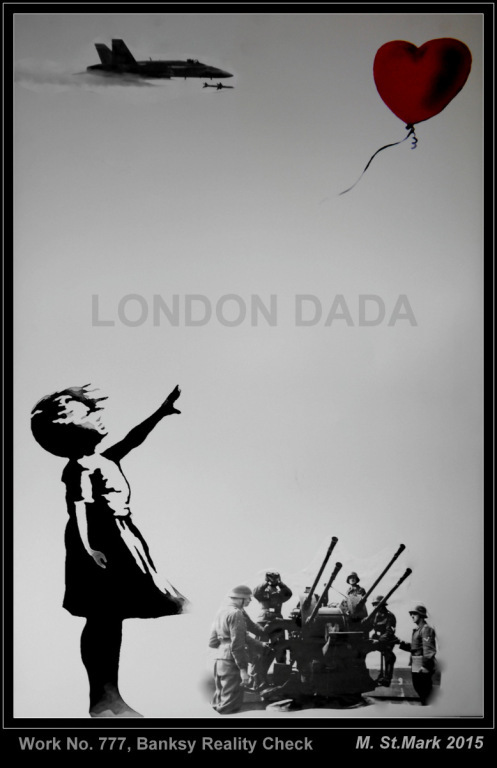 * Available in a signed limited edition of 10 only; we believe the only available late contemporary image of the world-famous street artist in the public domain. Banksy in Jamaica, without his latex prosthetic sharper end nose piece. The subject of Banksy’s royal interest & post to his Twitter account. * click to enlarge – the same give-away profile features of very prominent aquiline nose, except again, as in the Jamaican images without the latex prosthetic sharp-end nose piece; darkened ginger ( ginger being his natural hair colour ) – ‘tashed thin-lipped mouth covering a childhood surgery scar and again the prominent and distinctive Punch & Judy chin. 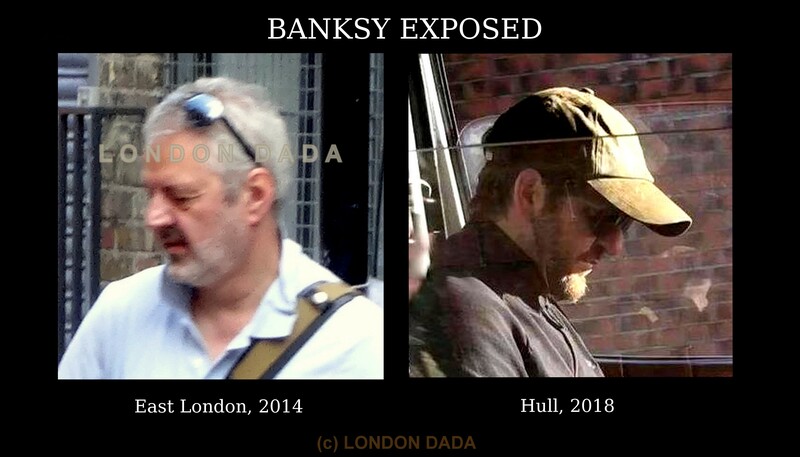 Also note the badly matching 2-part false beard disguise Banksy chooses to wear on this occasion in our enlarged screenshot from the recent video taken in Hull, looking more like a chin strap. 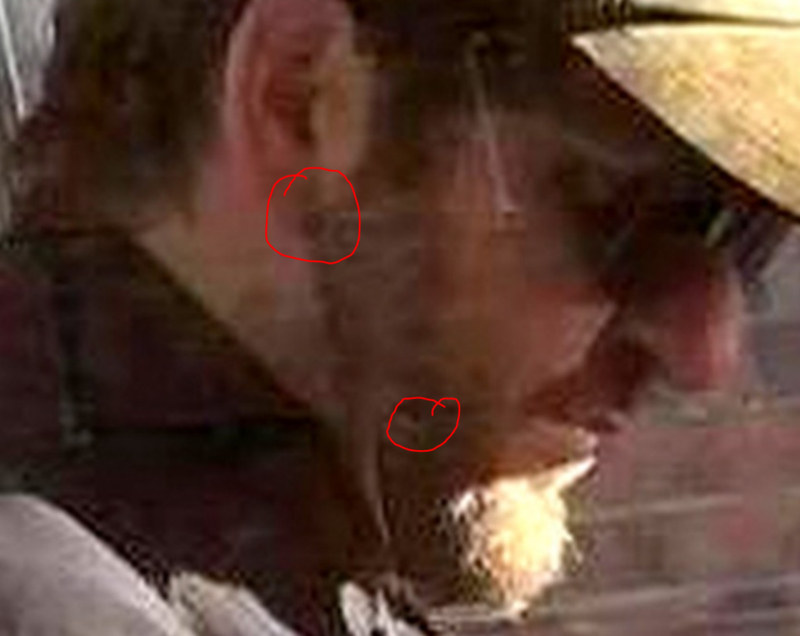 Careful scrutiny ( double click ) of the enlargement shows the sideburn part of the disguise is pinned to his right earlobe, probably through a pre-existing piercing, whilst the lower part of the disguise is attached via a small pin ( see red pen highlighted loops in the super enlargement below, click to view. ) ( Art Axis spot; 6th February 2018 ). 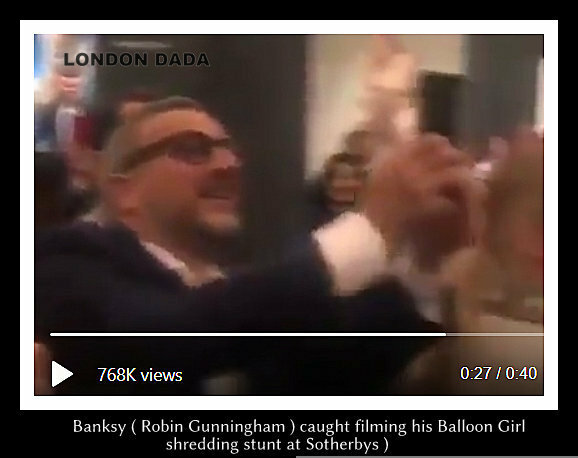 Confirming beyond doubt these two pictures show the same man, and that man is Robin Gunningham aka Banksy. 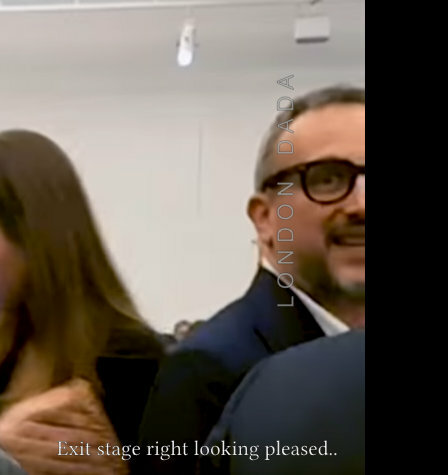 Banksy was said by some to be present in the audience filming the pre-arranged stunt.. and so were other folk, one of whom panned her Smartphone camera across the room, taking in a dozen heads along the way. 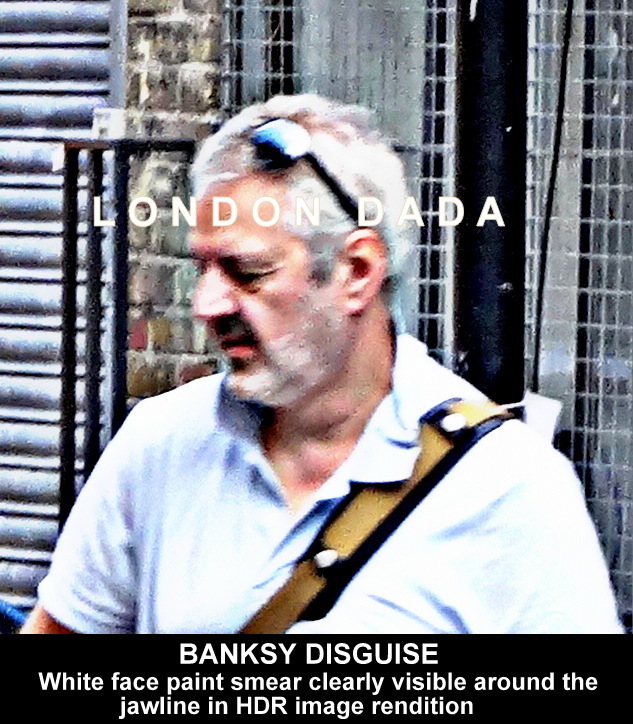 London Dada’s Art Axis – who close-up’d Banksy in 2014 paused the video ( an online upload ) at the point where he recognized someone uncannily similar to Banksy face-wise with recent front teeth orthodontology; this time with hair cropped short, the obligatory moustache and giveaway prominent dimpled chin and aquiline nose, this time using the latex prosthetic end-nose piece . The gent was decked out in a business suit with white loose-necked shirt and sporting dark tortoiseshell-framed glasses, wih what appears to be a miniature spy camera attached to the right side keeper. Cameraphone in hand, he’s obviously enjoying the proceedings…however he is filming with his smartphone in portrait mode whereas other video featured on his Instagram account of the auction was shot in the pro standard landscape format, suggesting the gym-fit assistant/minder he always works alongside for cover and security was filming the event for Banksy’s official Instagram account from close by in the auction room. 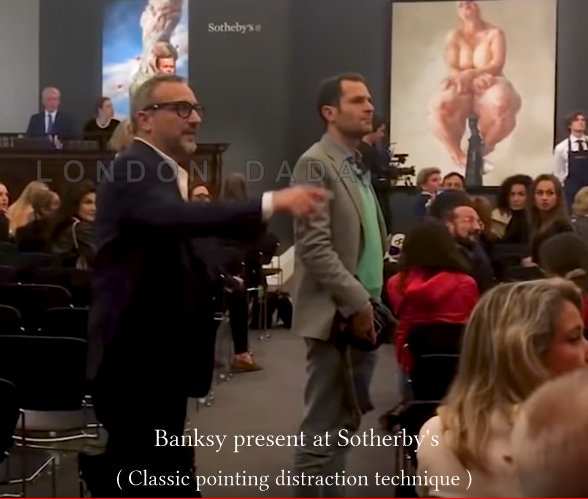 After further close analysis and cross-compares, we can say with 100% certainty that this individual, previously filmed elsewhere in the Sotheby’s auction room, is Banksy himself; finally, inadvertently, caught in close-up on his own video. 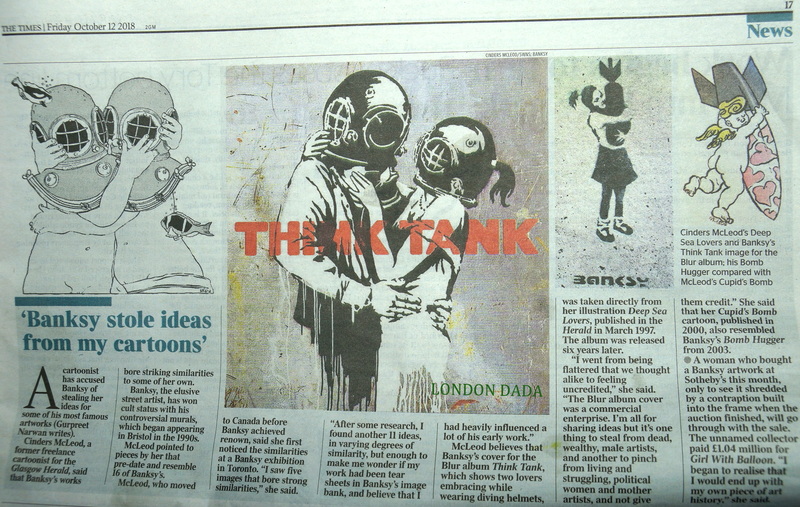 Compare with the same loose fitting combo style in the known photo of Banksy by Steve Lazarides, bottom right. Bank customer formica convenience desk used for writing sundry credit/debit/cash/cheque paper transactions over many years. 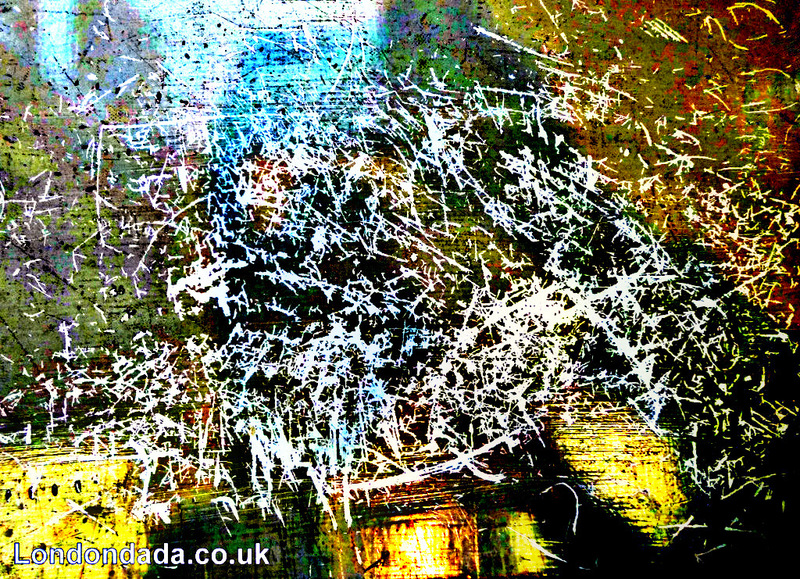 (Multi-stage digital enhancements, hand-finished in acrylic each edition). 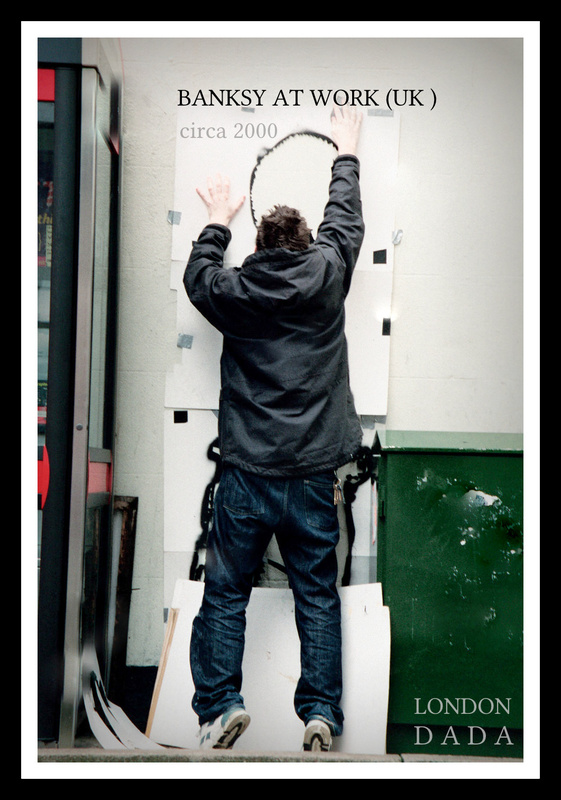 Signed limited edition of 25 Lightjet prints onto Ilford Pearl, individually hand touch-finished. Related Work; 585; Cashpoint blues / Withdrawal Symptoms/ Money is a Frantic Language from 2012; cashpoint touch screen in high summer. 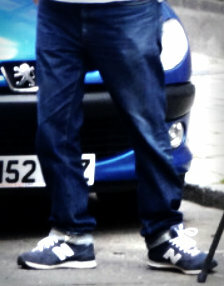 Work No. 714: Chihuahua Matador – bullfight in the park. Four-tone graffiti roller brush graffiti overpaint by Art Axis. Riddle you this; who’s the mega famous yet totally unknown graffiti artist behind the camera? – and at this very moment working on a new disguise. 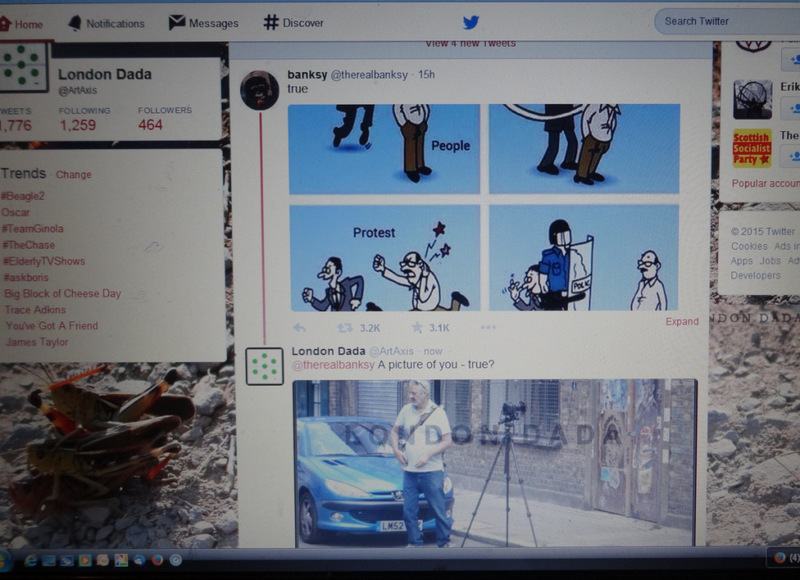 Drill & anglegrind tarmac demarkation points for future workforce guidance – an arcane language and an intriguing new art form is born.